I had a great chance this week to catch up with a friend from Venture Beat about my thoughts on what’s revolutionizing our world in this moment. While that’s a broad question, the answer is very specific: The patterns for how people buy and sell are shifting very rapidly. Buying and selling touches everything that we do. It is so foundational that any serious change has an enormous ripple effect. The winners will create systems based on what I’m about to say and the losers will not. Am I writing a big check? Sure. Am I right? Read on. In the tech world, people talk about specific technologies and describe their impact. That’s like looking through a keyhole at what’s actually happening. It would help to break out where hype is driving the conversation and where the smart enterprises are investing beyond the hype. Cloud is just a part – Cloud is a deployment mechanism that’s key to operational execution. It revolutionizes how we store, compute and provision and this plays a role but isn’t the end game. Big data is just a part – Enormous data sets allow us to see patterns that would otherwise be hidden and allow (for a lucky few) operational decisions to be made based on predictive information. Analytics are just a part – User-friendly analytics that tap into big data and operate at real-time speed are revolutionary, but only when the data is available and something can be done with the results. Apps are just a part – Apps will continue to be the purpose-built way to interact but complexity needs to be hidden from the user. Logic and data need to come together in a backend that hasn’t been architected for today’s world. Apps matter most where they evolve quickly in response to a changing environment. Mobile is a very important part – Mobile consumers and workers is very hyped but also very, very important to what’s happening. Mobile requirements are enormous and growing. The hype around mobile is well-deserved. Integration is the glue – Without the ability to simultaneously monitor many streams of information, the best gizmo or software in the world sits in a silo. Integration is the secret sauce of the revolution happening in commerce but it isn’t talked about enough. Managed file transfer is how it moves – securely moving enormous amounts of information at high-speed through very secure means has requirements that aren’t built in to most systems in use. In-memory data is the new database – There’s no time for running traditional queries against today’s volume and velocity of data. High-volume and unstructured data is moving and accumulating at rates that can’t be sorted, stored, transformed, loaded and the host of other patterns we’re used to. Cache memory is the only solution that keeps up with increasing requirements and complexity with both flexibility and speed. Log file management is critical – Tesla gave us a taste of how important system data can be. The security and performance of systems gets lost in the shuffle if we’re not ‘listening’ to what our networks, servers and other components are telling us in their log files in the moment. Event processing is the new sense and respond – There’s simply no way logic can be written as code or simple rules in a way that keeps up with how important sense and response has become. Also called complex event processing (CEP), it is the core technology that allows commerce to be automated, from supply chain to customer experience management. Business process is how it gets done – Anything getting faster needs to be better managed and more thoughtfully deployed. Business process management matters more to the commerce revolution than most realize. The central nervous system that’s doing the heavy lifting for all of this change is a combination of technologies built on a platform of speed and fast cycles of change. 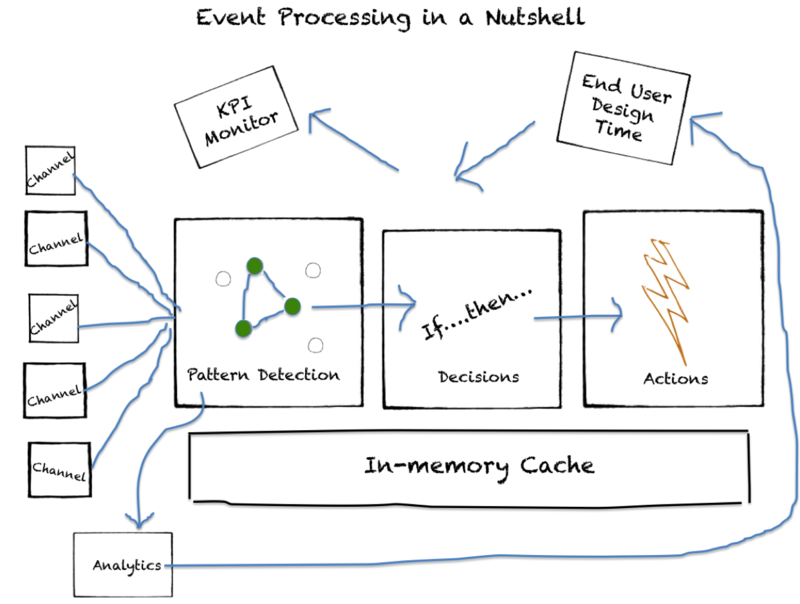 It has at is core event processing (think: streams of events) and looks conceptually like the diagram below. A quick look at the diagram and you can see where big data comes into the equation (channels, analytics), where cloud matters (storage, processing, efficient elasticity for surges), where analytics play a role (discovering patterns, constant refinement), social (as a channel to be parsed and understood), the Internet of Things (sensors are key channels), BPM (as how we execute), cache memory (as how we get lightning speed and consistency) and so on. New technologies and techniques will come along that can be layered into this model. Channels will increase and tax the system with more data and complexity, but this core concept will endure, mark my words.